Meet Alexander! A sweet, fun, loving kid! Just like any other 7 year old, he loves to play with friends and makes everyone around him smile! Unfortunately, when Alex was 2 years old, his mom discovered that her little boy would have a harder childhood that she would have ever imagined; he started having seizures. After many tests and medical bills, the doctors concluded that he should be fine and he’d grow out of the seizures. To everyone’s dismay, 5 more years had passed by and the seizures only have gotten worse. After a terrible episode not too long ago, he was rushed to the hospital. About every 3 to 6 months he has break through seizures which is caused by the epilepsy evolving. The doctors originally started with diagnosing one type of epilepsy, but as tests have continued, they now have found out actually he has 3 types.Doctors finally diagnosed him with complex partial epilepsy, focal grand maul, and ESES (electrical status epilepticus during slow wave sleep). He tries his best each day to be a ray of sunshine to his mom and family, but it’s been getting worse continually. ESES has caused not only constant seizures at night but has deterioration in cognitive and learning ability. It’s affecting such a young child in many ways; some of the side effects of the epilepsy are that he has difficulties socially, frequently has confusion, goes blind during seizures, and generally has an inability to convey feeling and thoughts. The scariest thing about it all is the worsening night time seizures; during these episodes, he chokes and his mom has to rush to his side to help him breathe again. The fear that he may not last through a night is too real for both mom and child. A miracle happened one day, when a fun-loving golden retriever puppy bounced into his life, giving him and his mom hope in desperate times. Lovingly named Navy, this dog was donated to become a potential seizure response dog to sense the seizures before they happen. Navy has passed several temperament tests and was selected for service dog training. 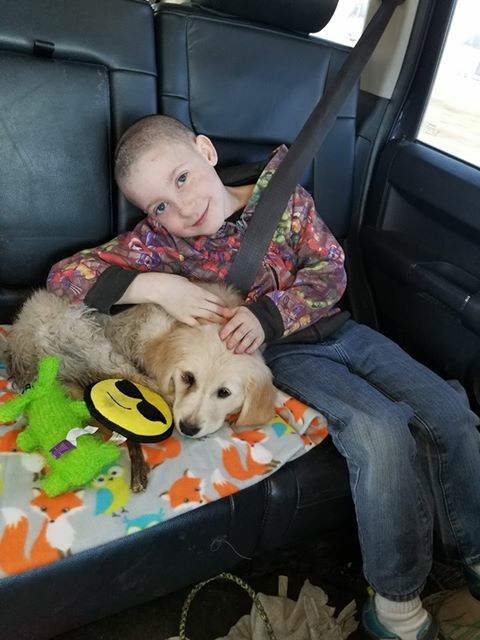 This puppy has become hope, a guardian, protector, and a comforter for Alex! 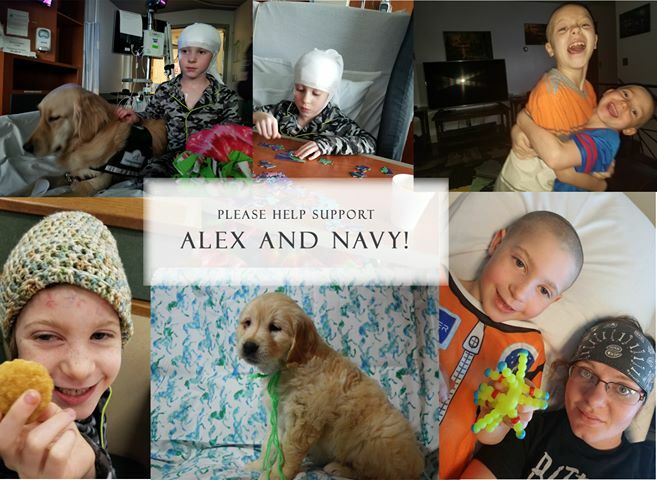 We are asking for your help to be able to afford the $15000 to put Navy through service dog training so she can sense the seizures and become even a bigger help to her boy that she loves so much! She will go through an extensive training at first to learn how to sense seizures before they happen, learn to cushion his head and protect him during an episode, and comfort him after an episode. Through training, Navy will become his literal life saver and protector.